Even Canadians without debt would feel the pinch from a credit crisis. OTTAWA — Even debt-free Canadians could eventually feel a pinch from someone else's maxed-out credit cards, suggests research presented to senior officials at the federal housing agency. Canada Mortgage and Housing Corp. board members received an update in March on the country's credit and housing trends. The presentation contained a warning: the steady climb of the household debt-to-GDP level had put Canada's long-term economic growth prospects at risk. The CMHC logo is seen on a Quebec City office building, September 15, 2010. The CMHC received a report arguing that rising household debt levels put Canada's long-term economic health at risk. 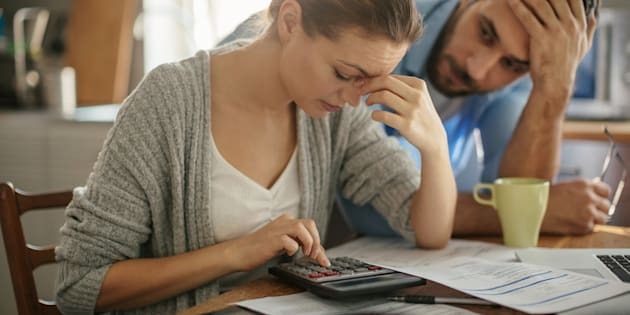 The strong expansion of household spending, encouraged by a prolonged period of historically low borrowing rates, has created concerns over Canadians' record-high debt loads. The Canadian Press obtained a copy of the CMHC presentation via the Access to Information Act. It was included in a "confidential" memo to deputy finance minister Paul Rochon. Citing international research, the CMHC presentation points to an estimate that says a one percentage point increase in household debt-to-GDP tends to lower growth in a country's real gross domestic product by 0.1 percentage points at least three years later. "Our results suggest that debt boosts consumption and GDP growth in the short run, with the bulk of the impact of increased indebtedness passing through the real economy in the space of one year," said the BIS report. "However, the long-run negative effects of debt eventually outweigh their short-term positive effects, with household debt accumulation ultimately proving to be a drag on growth." An accompanying chart in the CMHC presentation showed that between 2010 and 2016 Canada's household debt-to-GDP level rose by more than five percentage points. The household debt-to-GDP ratio increased from almost 93 per cent to just over 101 per cent at the end of 2016, Statistics Canada says. A reduction of even 0.1 percentage points in the country's GDP can have an impact. For example, Canada saw year-over-year growth in real GDP last year of 1.3 per cent. BMO chief economist Doug Porter says he doesn't dispute the broader conclusion that a rising household debt-to-GDP level poses risks for growth. But he's skeptical one can draw a direct line from the household debt-to-GDP directly to economic growth down the road. For one, he said interest rate levels must be factored in. "I'd be very cautious about putting pinpoint accuracy on that," Porter said. "I think that's incredibly difficult to do." However, Porter says the record levels of household debt piling up in Canada, like in many industrial-world economies, does suggest it will be tougher for the country to grow as quickly as it has in the past. "The consumer spending and housing gains that we could reap from lower interest rates have basically been reaped," he said. "And, if anything, interest rates are probably more likely to rise than fall from current levels. So, to me that suggests we just really can't count on the consumer to really pull the economy ahead as they have in recent years."